There’s been a lot of news about Apple this week, and there will be even more news about the company next week when it introduces the world to a watch, a new version of iOS, a new iPad model, a new iPhone and a bigger iPhone (according to Kevin Roose). On the “celebrity scandal” front, we’d like to turn your attention to the interview with CEO Tim Cook that went live on The Wall Street Journal last night. It’s particularly striking given the company’s “we’re looking into it” statement from Monday. It also fits very well with the narrative provided by our anonymous “insider” source, who told us that Cook is looking to put a friendlier — and more apologetic — face on the company he runs. Let’s just say Steve Jobs would not have given an interview like this one. 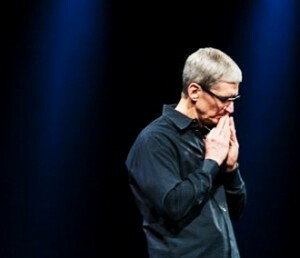 It’s not that Cook takes responsibility for the leak, because “none of the Apple IDs and passwords leaked from the company’s servers.” But he essentially capitulates to allowing it to happen. Indirectly. This interview reminds us of Cook’s apology for disaster that was Apple Maps. He displays a sensitivity verging on vulnerability that never even occurred to his predecessor. While it’s endearing on a personal level, we’re not sure whether it’s ultimately a good thing or not. One thing is clear: this is the new Apple.